Do it the old-fashioned wayThe wooden crafts John Wesley Powell took down the Colorado River 143 years ago are still the best way to run the rapids today—poetry to a rubber raft’s prose. Rafts bash through waves; wooden dories dance over them. Rafts slump downstream; dories hesitate effortlessly in the current before slicing between mid-river shoals. Sure, dories do flip more often—but I like to think that risk sharpens the experience. 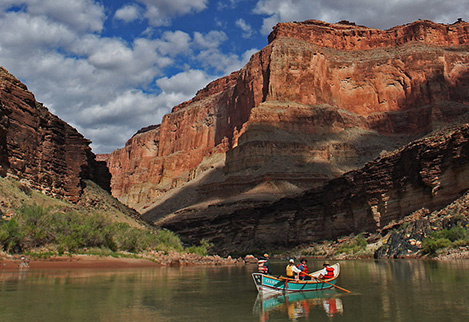 And because pretty much every Grand guide would rather row a dory down the Canyon’s 277 rollicking miles, their pilots are usually the most experienced on the river. Premiere outfit Grand Canyon Dories’ guides average 20 seasons apiece—experience that will enrich your 18-day trip in the form of stories, knowledge and yes, jokes. The other advantage to a wooden boat in the Grand Canyon? They travel faster downstream, leaving you more time for side hikes, or just relaxing with a book on the beach at camp.